After more than 35 years, the Audio-Animatronic figures that first debuted at the Magic Kingdom Park (in 1971) have officially returned to Walt Disney World. 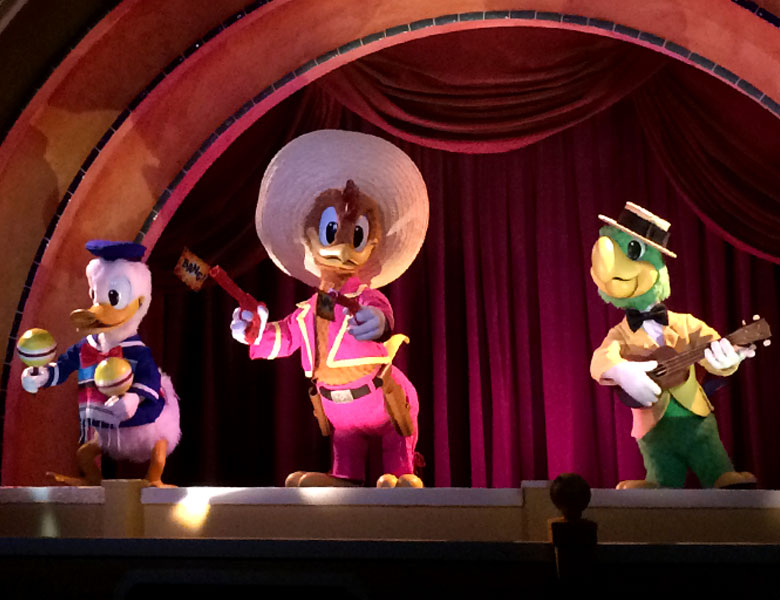 Originally premiering in Fantasyland's Mickey Mouse Revue attraction on Oct. 1, 1971, and later performing in the same attraction at Tokyo Disneyland Resort, the original Panchito, José Carioca, and Donald Duck figures appeared today in the grand finale of Gran Fiesta Tour Starring the Three Caballeros at Epcot. According to the D23 site, "The happy amigos hold a special place in Walt Disney World history, going back to April 1969, when government and media officials gathered in Ocoee for a first glimpse at the long-awaited “Project Florida.” Among the imaginative pieces showcased at the unveiling were concept artwork, a massive scale model of the master plan, figures from the Tropical Serenade attraction… and these happy chappies." After the Mickey Mouse Revue closed at the Magic Kingdom in 1980, the three Audio-Animatronics were shipped to Tokyo Disneyland where they began "performing" in 1983. They remained there for about 26 years, until the attraction closed to make way for Japan's version of Mickey’s PhilharMagic in 2009. Be sure to visit the official D23 website to learn more about these amazing Audio-Animatronic figures! Wow....a WDW attraction has been "plussed"! Wow, They look amazing! I love this ride. I can't wait to see them in person! Too bad Oriental Land Co. doesn't own Epcot. This ride should be spectacular given Mexico's rich culture and history. Just saw them yesterday and it was a very pleasant surprise. They look great! This was always my favorite ride to visit when I was a kid. Even better now that the Three Caballeros have returned!